How Long Does It Take for Series Ee Bonds to Mature? When purchasing U.S. Treasury bonds, you may have wondered why Series EE savings bonds mature on different dates. For example, the U.S. Treasury's EE bonds issued in 1981 and 1982 took only eight years to reach full face value, while the same EE bonds issued in 2003 took twenty years to reach their full face value. These drastically different maturity dates result from the differing rates of interest built into each Series EE bond when it is issued. These savings bonds work as a type of so-called zero coupon bond, in which bond coupons, or interest payments, are added to the bond's starting, or principal value rather than paid out as a check or direct deposit. If you purchase an EE bond, you'll get it at a discount from face value. This discount equals the number of interest payments you can expect to receive. Over the span of time until the bond matures, your bond grows in value by the amount of interest, or coupons, accrued each year as the instrument builds up to its face, or redemption value. How Long Should You Wait to Cash EE Bonds? The U.S. Treasury Department gives you a guarantee that your EE bonds will reach maturity in 20 years. However, some reach maturity sooner depending on their built-in interest rate, and once you've held the bond for at least five years, you can cash them in at any time. If you hold your bonds for 20 years and they still haven't reached their full face value, the Treasury will do a one-time adjustment to bring up the bond's value so that you can cash it in for its full amount. For example, the paper certificate version of Series EE savings bonds are issued at half of the face value. A $100 Series EE bond, for instance, would cost you $50 at the time you bought it and could take up to 20 years to mature to $100. This is different from electronically-purchased Series EE bonds bought through the TreasuryDirect program, which you buy at its principal value. The Treasury guarantees that electronic EE bonds will be worth double their principal amount 20 years. If you don't cash in your bond, it will continue to earn interest for another 10 years, for a total of 30 years. 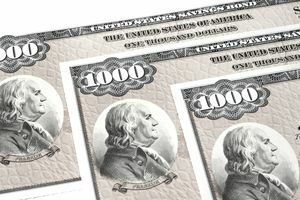 The Treasury Department periodically changes the rules for how they calculate interest on savings bonds, for new bonds issued after a certain date. During the period of 1982 to 1983, interest rates were extremely high. However, in 2003, interest rates were extremely low. Thus, it took less time for the value of the 1982 to 1983 bonds to compound from their cost, half of the face value, to their full face value. It took more time for the same thing to happen to the bonds issued in 2003 because the interest rate was much lower. How Do You Calculate the Time to Maturity? You can calculate the time to maturity using the Rule of 72. This simple rule lets you calculate how long it would take to double your investment at a given rate of return. For example, if you spent $500 to buy a new Series EE savings bond with a $1,000 face value, that earned a fixed rate of 1.20 percent, how long would it take to reach its maturity value? Simply divide 72 by 1.2. The answer, 60, reveals the total number of years necessary for the bond to double in value. If the Series EE savings bond earned 0.5 percent, it would take 144 years to double in value (72/0.5 = 144). By understanding Series EE savings bonds time to maturity better, you have more information to help you decide if they make sense for your portfolio. You could choose another alternative instead, such as buying broadly-diversified blue-chip stocks and earning at least 3 percent to 4 percent on your money. If you have the fortitude to watch your account value fluctuate up and down depending on the stock market's activity, or if you are in it purely for the cash income and you don't mind volatility, stocks may be a much better option. You and your professional adviser can decide what works based on your own needs, resources, and personality, and arming yourself with knowledge makes that decision easier.